Samsung Galaxy Note N7000 next to the smaller Apple iPhone 4 both displays at 100% brightness. Is the Samsung Note the perfect phone for the photographer? Years ago when I first started using an iPhone people would asked me how I could use such a large phone. Now years later the iPhone seems downright small compared to other modern devices. If you are like me you own a tablet but do not seem to be able to bring yourself to take the thing out of the living room. Tablets are just too large and inconvenient to have with you all the time and without a real keyboard just too limited in usefulness. You might be the kind of person that just hates tablets. If I am going to carry something that needs a case I will just take my MacBook Air. As a photographer I need a device that will my show images at their best and at the same time it needs to be small enough that I can take it everywhere. The 3.5 inch iPhone is just too small for me. The iPad is just too large and inconvenient to carrying all day. 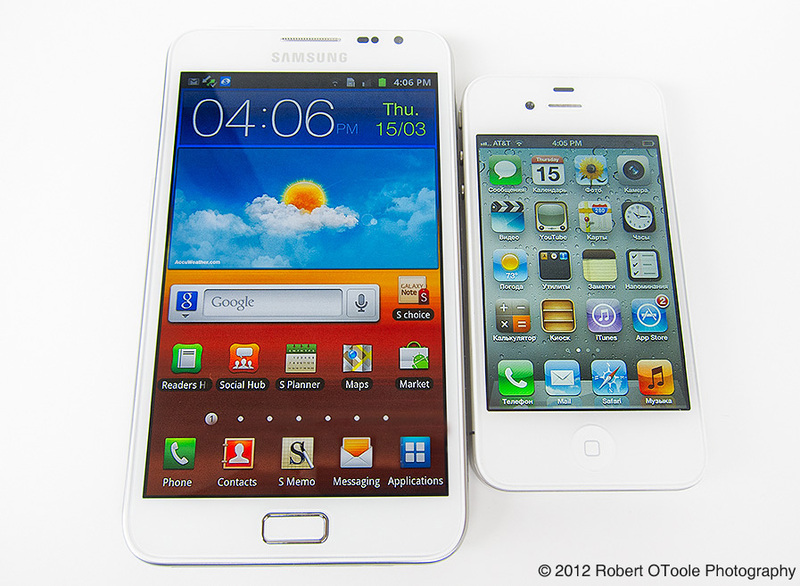 The 5.3 inch Samsung Note seems to be the perfect solution. The entire iPhone 4 fits inside of the Note's screen area. So what is so good about a Note? Take a look at the image above with my 5.3 inch Samsung Note under a 3.5 inch iPhone 4. The iPhone fits completely inside the Note's display. The Note features a 1280x800 px 15.3 in WXGA HD Super AMOLED screen (the iPhone measures in at 3.5-inch and 960×640 px). The AMOLED screen is crisp and bright with deep blacks and bright colors (note that they are not the most accurate) and show my 2560 x 1600 px images very well. Best of all the Note plugs into a laptop with supplied standard Micro USB 2.0 cable and appears as a disk drive making adding images a totally painless super quick and iTunes free process. The Note also uses a removable microSD card for storage and easy memory upgrades. The Note is large but easily fits inside my pockets comfortably and using the phone for calls is also very comfortable. Browsing the internet with the Note and it's 1280 x 800 display is so good that you will not want to go back to a smaller device. Overall the note does everyday tasks very well without any issues. Battery life compared to an iPhone is no contest. On a busy day my iPhone is done before lunch time and has to be charged constantly to last the entire day. The Note has a much larger battery capacity of 2500 mAh vs. 1420 mAh for the iPhone and is easily removable if needed. Charging on the Note takes a standard Micro USB to USB 2.0 cable. Samsung Note screenshot image with scribbled notes using the stylus and screenshot function. One of the more interesting features of the Note it the ability to grab any screenshots with the touch of a single button while holding the stylus on the screen. Then you can add notes or draw on then using the stylus and email, save or share. The Note stylus uses a Wacom digitiser system which results in accurate pressure-sensitive input. So far I don't have much use for this feature but it is nice to have the capability or note taking or being able to draw on any screen. Currently the Note is available through AT&T in the US but rumors are that T-Mobile, Spring and others will carry the phone later this year. Samsung has sold more than 5 million notes already this year.